Hospice is a philosophy of care, not a place. 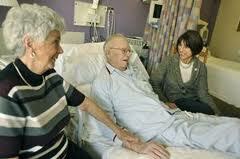 Hospice provides care for both the patient and the family well before and after the time of death. It is a way of caring that treats the whole person – physical, social, emotional and spiritual – and recognizes managing a life-limiting illness and dying as normal parts of living. Hospice is about care, not cure, and thus focuses on the quality of remaining life. Each person is worthy of our best care. Our patients and their families are held in the highest esteem. We are honored to meet the needs of those we serve.